Today Google announced a new version of the Android Market via its Android Developers Blog, and it aims to ease the pain of navigating the current market. The layout is entirely different, as it's designed to highlight top apps and games and improve the user experience. 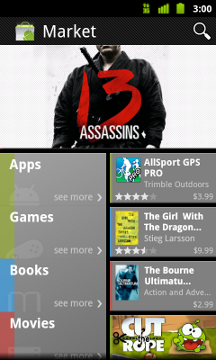 The update will also bring the addition of Books and Movies to US handsets, and other "select countries" soon after. Update: Why wait if you can download the new Market right now. The entire experience looks to be streamlined, with a much more intuitive layout and quicker access to to what you're looking for. The new Market also incorporates swiping through pages of Top Free, Top Paid, Top Grossing, Top New Paid, Top New Free, and Trending Lists, as opposed to the tabs that we've become accustomed to seeing in past markets. The app details page has also taken on an overhaul, with a static bar along the top that includes the app name and quick access to download/buy. Just below that is a scrollable list of screenshots, as well as description, changelog, and reviews. A phased rollout is already underway to phones running Froyo or higher, and is expected to hit all phones worldwide in the coming weeks.